As essential oils and hydrosols gain popularity, more and more of us are investing in glass or copper stills to make our own. My still is copper, and I chose copper for my still because not only is that metal an excellent conductor of heat, making for very even distilling, but copper is also wonderfully beneficial to the skin. While it might feel intimidating at first, using a copper still is actually beautifully simple. Before you use it, wash and dry every part well. You may also want to do a scrub with vodka or other strong alcohol to really clean the surfaces. Next, you will do a round of distilling with only water (no plant matter) to really clean your still. I do this extra step each time I use my still, to make sure it is completely clean and to remove any potential residue. Put only water in your still, attach the "onion" to the base, and fill the condenser (the pot with the coil of metal inside) with ice and water. As the ice melts, keep replenishing it. You will have two bits of tubing that come with your kit. If you purchased your still independently (not as a set) you will need to purchase two. One is for draining this coil pot/condenser. The other is for collecting what comes out of the coil - your hydrosol and the essential oil. Put the base of the still on a low flame - I use a camp stove for mine. Make sure the coil pot is below the base of the still. Have a clean pint jar to catch the hydrosol as it comes out. You will want to make sure liquid is not pouring out of the tubing. Instead, it should drip out one drop after another. Turn the heat down if liquid is coming out too quickly. I usually continue the cleaning run for around 20 minutes. After your still is completely clean, you are ready to begin. Fill the base with your desired herb no higher than the rivet line (the line of dots you can see from the outside). Another way to say this is no more than 3/4 full. Cover your herbs with warm distilled water, clean spring water or rainwater. 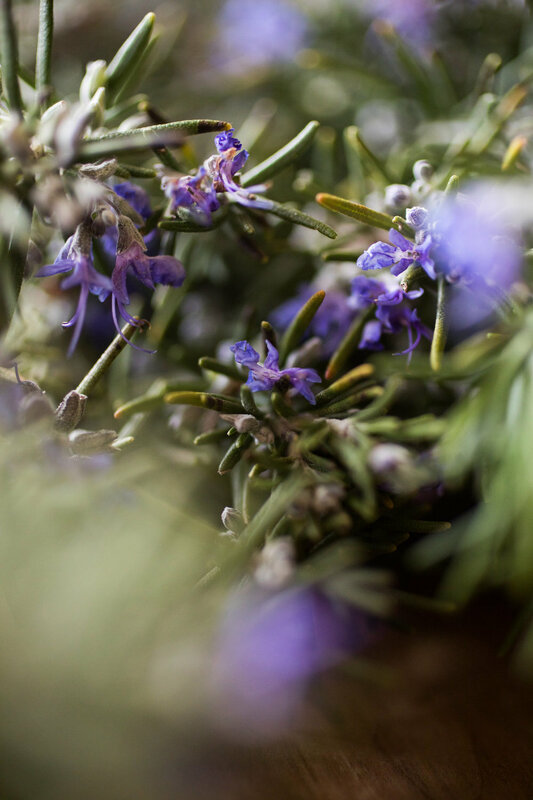 In these photos, I've used rosemary (Rosmarinus officinalus). Make sure you don't have too much plant matter in there, and that it can move freely in the water. This is very important, so that none of it scorches or burns. Then, you will repeat the process you just did with plain water - put the base on a very low flame, make sure the condenser (coil pot) is filled with ice, and replenish the ice as needed so there is always plenty of ice in there. After a few minutes, you will notice drops coming out of the tubing leading from the condenser (note that water will be flowing out of the other tube as ice is added, so that it does not spill out of the top). Make sure the hydrosol is coming out drop by drop, and not pouring out too fast. This is an art. It should be - drop. drop. drop. and not - tinkle trinkle tinkle, with many drops coming out all together. You should be able to see drops coming out. When in doubt, turn the heat down. Once you have collected no more than 1/2 the water you initially started with, it is time to stop. Let your hydrosol settle. If you have made a lot, and from a plant with a high volatile oil content, you will be able to use a dropper (or you can buy a special tool for this) to collect the essential oil which will settle at the top. As a final step, I use a coffee filter to strain the hydrosol, because I like mine crystal clear. Then you may bottle it, and in a cool, dry and dark place it should keep for at least a year, often much longer. We use these precious hydrosols in our skincare line. They make up the bulk of our toner, and are also a main ingredient in our face lotion. And if you don't have a still of your own, see our previous post for instructions on making flower water with simple equipment you already have in your kitchen.